Fritillaria thunbergii is thought to be naturalised rather than native in Japan, where it has been cultivated as a medicinal plant for several hundred years. It is easily grown in a partially shaded but warm situation, such as under deciduous shrubs or small trees, and will form a clump of tall slender stems. The tendril-like upper leaves will twine around any suitable support. Flowering occurs in April and May, and the stems die down in summer. Thunberg fritillary is widely cultivated and has been grown commercially as a medicine in China for 700 years. It is easily grown in a partially shaded but warm situation, such as under deciduous shrubs or small trees, and will form a clump of tall slender stems. The tendril-like upper leaves will twine around any suitable support. Flowering occurs in April and May, and the stems die down in summer. Naturalised in Japan and parts of China, where it is possibly native in Anhui, Jiangsu and Zhejiang provinces. A recent discovery suggests that it may have originated in the Tarbagatai Mountains in Kazakhstan. The bulbs are small, white and almost spherical, with numerous bulbils. The stems are up to 60 cm tall with many whorls of narrow leaves, the upper leaves forming tendrils. There are usually about four flowers, which are rounded, bell-shaped, nodding, around 2.5 cm long and pale yellow with purple or purplish brown spots or squares. Each flower has six stamens and a style that is divided into three branches. The fruit is a capsule with six wings and three rows of flat seeds. The exact native distribution of Fritillaria thunbergii is unknown. 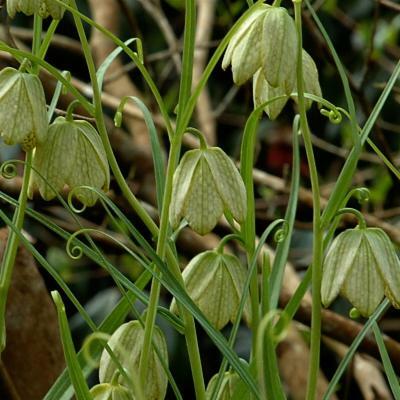 Bulbs of other Fritillaria species are often collected in the wild for medicinal use, but F. thunbergii has been widely cultivated and used commercially as a medicine in China for 700 years. 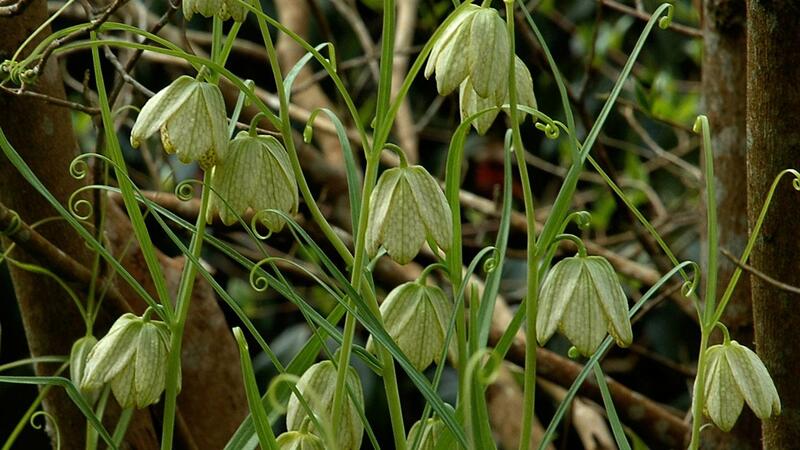 The bulbs of Fritillaria , called 'bei mu', are among the most popular herbal medicines in China. Bulbs of Fritillaria thunbergii are the source of the traditional Chinese medicine (TCM) 'zhe bei mu', and are used to treat coughs and other respiratory complaints. This fritillary is also used medicinally in Japan, where it is also cultivated as an ornamental. Since the early 1990s there has been a large increase in the diversity of plant-based products traded worldwide for making cosmetics, herbal medicines (especially traditional Chinese medicines), functional foods, potpourri, colouring agents and pet products. Kew scientists at the Chinese Medicinal Plants Authentication and Conservation Centre (CMPACC), study these using a range of morphological as well as chemical and DNA fingerprinting methods to identify the species of plants being traded and determine whether plant-derived products contain an appropriate range of compounds associated with their proposed use. Over 1,000 species and 1,500 plant extracts have been studied so far. Although in most cases the correct species has been traded, we have encountered a few incidents when incorrect species or poor quality substitutes have been used. Other issues relate to the over-exploitation of some species, especially those that are wild harvested where there is a need to develop sustainable harvesting practises to avoid adulterants or poor quality material entering the trade. In 2006, staff from the Centre visited a major Fritillaria 'natural fostering' project in the Ganzi district of Sichuan on the Tibetan Plateau. A related species of fritillary, Fritillaria cirrhosa , has been re-introduced there in an attempt to re-populate this species in its natural habitat. Like Fritillaria thunbergii this species has suffered decline due to collecting for medicinal purposes. At Kew, Thunberg fritillary is grown in clay pots in the Alpine Nursery, in a soil mixture of one part loam-based compost, two parts 3-5 mm grit and one part coir (coconut fibre). Pots are kept in a well-ventilated cold frame, where they are protected from rain and watering can be controlled. In addition, this species does well in the open garden in a sunny position as long as the soil is allowed to dry out in summer. In the Alpine Nursery, the bulbs are re-potted in the summer to provide fresh soil and allow inspection of bulbs for signs of disease. Once in new soil, bulbs are watered in, and growth begins in autumn. Pots are plunged into a sand bench to prevent them from freezing during the winter and aid watering by stopping the soil from drying out too quickly. The sand in the bench is watered during the growing season to provide some moisture through the sides of the porous clay pots. When leaves appear above soil level, watering is increased, and the soil is not allowed to dry out until plants die back in late spring. Low nitrogen liquid feed is given once a month during watering to provide additional nutrients. At Kew, flowering takes place in April. Fritillaria thunbergii often increases by bulb offsets, which can be separated during re-potting. At Kew, Thunberg fritillary is grown among shrubs in the Woodland Garden (the area around the Temple of Aeolus) and in the behind-the-scenes Alpine Yard. Pressed and dried specimens of many Fritillaria species are held in Kew's Herbarium, where they are available to researchers from around the world, by appointment. The details of some of these, including images, can be seen online in the Herbarium Catalogue. Phylogeny is the term used to describe the evolutionary relationships of a species or group of species. The phylogenetic relationships between fritillary species and between the genus Fritillaria and other genera within the family Liliaceae have been the subject of research at Kew since the 1990s. Unravelling these relationships is essential to provide a framework for understanding the evolution of other morphological and genomic characters. In fritillaries, one particular character that has been studied in detail is 'genome size' - a term referring to the total amount of DNA within the nucleus of a cell. It is usually characteristic for a species. Fritillaria species have some of the largest genomes of any angiosperm (flowering plants), which generally have small genomes. Even the smallest Fritillaria genome has about 10 times more DNA than the human genome, whereas F. thunbergii has about 13 times more DNA compared with humans. Trying to understand why and how fritillary genomes became so large is currently the focus of a three-year NERC-funded research grant. Hills in scrub, bamboo forests, shady and moist places from near sea level to 600 m elevation. Possibly threatened by collection from the wild for medicinal use. Contains alkaloids; serious adverse reactions have been reported when ingested in medicinal overdose. Naito, T. (2005). The Endemic Fritillaria species of Japan Curtis's Botanical Magazine 22: 189-196. World Checklist of Selected Plant Families (2010). Fritillaria thunbergii. The Board of Trustees of the Royal Botanic Gardens, Kew. Leon, C., Fay, M. F. & Rix, M. (2009). Fritillaria yuminensis Liliaceae. Curtis’s Botanical Magazine 26: 21-32. Ruksans, J. (2007). Buried Treasures: Finding and Growing the World’s Choicest Bulbs. Timber Press, Portland, Oregon. Mathew, B. (2000). Fritillaria thunbergii. Curtis’s Botanical Magazine 17: tab. 393. Bensky, D. & Gamble, A. (with T. Kaptchuk) (1993). Chinese Herbal Medicine Materia Medica. Revised Edition. Eastland Press, Seattle, Washington. Phillips, R. & Rix, M. (1989). Bulbs. Pan Macmillan, London.